This package for a total of £55 is available for a two night stay (thus giving a £27 nightly rate). If you stay only 1 night, then the price is £35 per night. Travel dates are available all days until mid December 2014. Rates are non-refundable. Considering also the dinner voucher, this deal represents a 50% discount compared to booking.com. This autumn sale is available for booking until 15 October 2014. The deal offers 2 night stays for a total of £60, thus giving a £30 per night rate. Rates are non-cancellable, so book only if your plans are certain. This promotion code is valid for most of the NH Hotels in Germany for travel also during 2015. The voucher code will return a 25% discount compared to their regular flexible rate. This promotional rate is flexible, meaning you can cancel for free up to 48 hours before check-in date. To use the code click on the button "Promotional code" in the search form, just above the "Search" button. Not all NH Hotels are participating, but you will see those that offer the discount at the top of the search results. lastminute.com offers this perfect opportunity to visit the famous Wembley Stadium. The e-vouchers can be used until 30 April 2015. Details on how to arrange your visit will be sent together with the voucher after the purchase. Very good deal at this Hyatt hotel located at the Amsterdam airport. The price includes breakfast, Wi-Fi and parking. These rates can be booked until 22 September 2014. The reservations are non-refundable. Furthermore, your credit card is charged directly by the hotel at check-out, so the stay would also be eligible for points. This promotion is valid at the selected Radisson, Park Inn and Country Inn and Suites properties in the United States, Canada, Belize, Brazil, Chile, Columbia, Costa Rica, Ecuador, Grenada, Panama and Trinidad and Tobago. How it works: when you stay three week-end nights, you will pay only the first two. The third night is free. You must stay from Friday to Monday or from Saturday to Tuesday. You must be a member of Club Carlson, the Radisson loyalty programme. If you are not yet a member, join here for free. Conrad Hotels and Resorts runs a promotion called "Compliments of Conrad", valid at 24 of their properties worldwide (across Europe, Africa, Middle East, Asia and USA). Under the terms and conditions, the last night is free for stays of minimum 4 nights. This last night is deducted at check-out from the hotel bill. Looked at it differently, this means that for a 4 night stay, you get a total discount of 25%. When making the reservation, look for the rate called "With Our Compliments". If you cannot see this rate, click on the button "View packages and promotions for this room" and pick this rate from the full list of offers shown. You will see that the price shown for this special rate is the same as the regular rate. However, when you check out from the hotel the last night will be deleted from the bill and you will not have to pay for it. A deposit equal to the rate for the 1st night is charged on your credit card when you make the reservation. This charge is non/refundable if you want to cancel or change the reservation. Remember to register also for these promotions to benefit from additional HHonors points when you stay at Conrad hotels. Great deal for a stopover in Vienna, a the three star hotel Lena West. This is not a hotel if you want to spend a romantic holiday in Vienna, however it is perfect if you are just passing by and need a place to rest, not far from the highway, but also easy to get into town by car. These rates are available for stays until the end of November 2014. The reservations are non-refundable. Flash sale at Conrad Macao, available for bookings until 16 September (Macao time). Stays until 20 February 2015 (blackout dates: 1 to 6 October, 31 December 2014 and 1 January 2015). A 5-day sale from Hilton - book until 13 September 2014, for stays until the end of this year. There are 11 Hilton properties participating in this offer, in locations such as: Bangkok, Koh Samui, Pattaya, Phuket and Hua Hin. IHG Rewards (the loyalty programme of InterContinental, Crowne Plaza, Holiday Inn) has just launched their new promotion, called "Into the Nights". We like the IHG Rewards programme especially for their Point Breaks feature, which is a regular selection of hotels sold for only 5 000 points per night (that means that this promotion will bring 12 free nights at a Point Breaks hotel). This promotion is adapted to the travel patterns of each member of IHG Rewards. 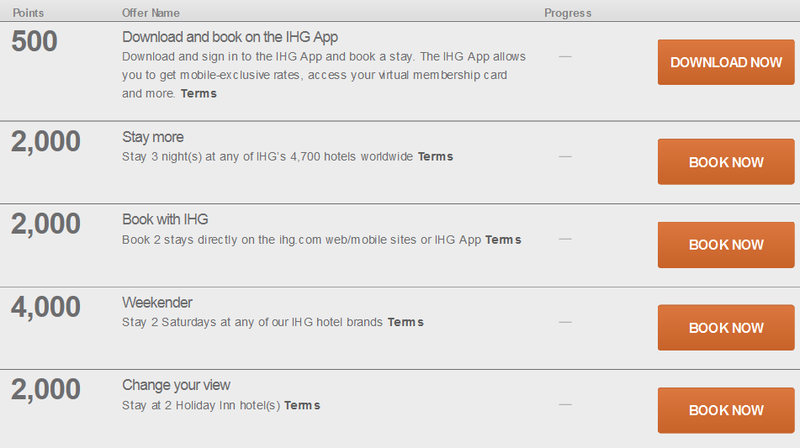 That means that it is not a standard promotion for all, but a personalised offer as put together by IHG Rewards. In order to gain the points, you must complete several challenges, such as, for example, stays two Staurday nights, or staying at a specific brand, or making several reservations directly on IHG website, etc. Thus, after having completed the 5 challenges, you will get the 10 500 points, plus a 50 000 bonus. Why is this easy? Because you can accomplish all these 5 challenges with just a total of 3 nights at two different Holiday Inn hotels (not to confuse with Holiday Inn Express, which is a different brand). - you must book at a Holiday Inn. - you must book at a different Holiday Inn than the first one. That's it. After your second stay, you should see your account updated with the 10 500 points. At the same time, for the bonus, you will be given the choice of either additional 50 000 points or a voucher for 2 nights in any property (this might be valuable in certain very expensive hotels, like the InterContinental in Paris, for example). However, we usually take the points, especially for the Point Breaks option, as explained at the beginning of this post. Offer valid for members of the Accor loyalty programme, for stays of minimum 2 nights from Friday to Monday.